When I accepted the position of National Beat Reporter, I knew that it came with a unique responsibility. The world we live in is a constantly-changing, unpredictable, and very confusing place. Sometimes, making sense of the world and this country can be very daunting. As college students, we tend to feel a lot of cynicism towards politics and the way this country is run, and that is totally understandable. My goal is to make this crazy country we live in make a little more sense. There’s a reason Justice Ruth Bader Ginsburg started dozing off at the State of the Union—it’s not exactly thrilling. 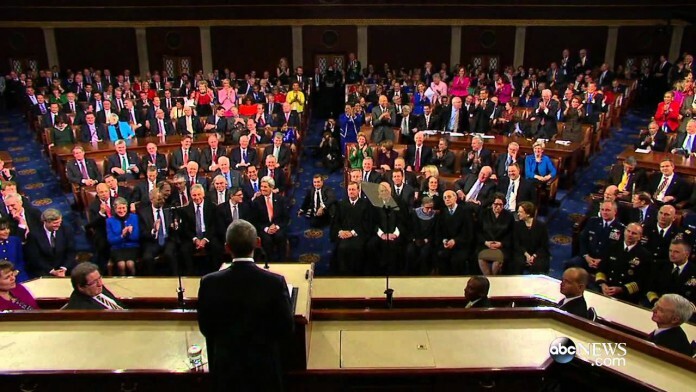 But the speech is pretty much the one day of the year where the President of the United States gets a chance to speak directly to Congress (the people who make the laws) and more importantly the American public (the people who choose the people who make the laws) about the issues that the country is facing and how they as President plan to help move the country forward. Of course, there’s no way we can possibly cover everything that was said. Rather than go through the speech issue by issue, we’ll explore five important themes from the speech, and why they matter. So lets see what all the fuss is about. With a renewed sense of confidence and optimism following a brutal campaign season for the Democrats, the President stressed that the United States is in much better economic shape than when he took office. One of the biggest ideas Obama expressed was one that echoed his 2012 re-election campaign slogan: “Forward.” Emphasizing an improving economy, a shrinking deficit, rising job growth, and lower unemployment, Obama attempted to make the case that his policies have helped the country recover from one of its worst economic disasters since the Great Depression, and that the focus now should be on keeping the momentum going and building on the progress that has been made, instead of stripping down the policies that have led to the recovery. He also mentioned that any proposed legislation that gets in the way of this progress will have earned his veto. For the past few years, Obama’s stance on the economy has been aimed toward helping the unemployed and the poor. However, if he is making the argument that his policies have been helping to lower unemployment and increase job growth, sticking to this narrative would be unwise and counterproductive. Increasing the minimum wage, eliminating tax code loopholes that benefit the super-wealthy, providing childcare and paid sick leave for working families, and providing free community college are just some of the changes Obama argued would help the middle class feel more secure in a world that is constantly changing. Framing foreign policy in a broader context, Obama focused on long-term and mutually-beneficial partnerships with other countries, rather than armed conflicts, as a means of securing economic prosperity and peace for the U.S. and the world. Citing the current conflicts in Russia and the Middle East, Obama argued that war should only be used as a last resort and that the benefits of economic interdependence and development between nations far outweigh the cost of war. Due to sanctions by the U.S. and its allies in response to Putin’s aggressive actions in Ukraine, Russia is now left with a crippled economy and a currency that continues to plummet. Putin has also isolated his international partnerships as the U.S. pursues renewed diplomatic relations with Cuba, a new climate change partnership with China, and a breakthrough nuclear deal with India. Briefly reflecting on some of the more controversial issues such as immigration, the cases of police brutality in Ferguson and New York, and women’s health issues, Obama urged young people to avoid falling into cynicism. He argued for “a better politics” in which Congress focuses on common goals and bridging divides, instead of benefiting from partisanship and gridlock. Offering to work with and seek ideas from Republicans, Obama asked Congress to start thinking beyond the next election and to not allow politics to get in the way of progress. While undoubtedly entertaining, this statement points to an even larger truth. These really are the final two years of Barack Obama’s time as President of the United States. Think about that for a second. That is a brave thing to say to a Congress where the majority is convinced that you don’t believe in what is best for America. But, with the economy making a comeback, a shrinking federal deficit, steady job growth over the last few years, unemployment on the decline, and two wars and a recession in the rear view mirror, Obama is in a good position to start proposing policies that reflect this new reality of a post-recession era for the U.S. His challenge lies in working to get his agenda through a Republican-led legislature.